Few weeks ago we visited Nuvali in Sta. Rosa Laguna. It wasn’t a planned. My sister called asking us if we wanted to come with them in Nuvali. I joined them because daughter and I haven’t visited any places this year aside from our place. We left Lucena at around 11 am. We thought at 1-2pm we will be in Nuvali already. Sadly, it didn’t happen because of heavy traffic in Tiaong, Quezon. There was a bridge construction in the area which really brought traffic not for a day but for many days. We were stacked for so long that we decided to change our route. Imagined vehicles going to Manila used all the roads including vehicles going back to Lucena. So we went back and go to the route going to Batangas. After a long drive we finally landed into our destination. And because we arrived late at around 5-6pm we didn’t see the beauty of Nuvali. One thing we wanted to do is the fish feeding activity. Too bad, it’s getting dark so we didn’t enjoy that much but at least we still saw fishes. It would be nice to have pictures with fishes as background. 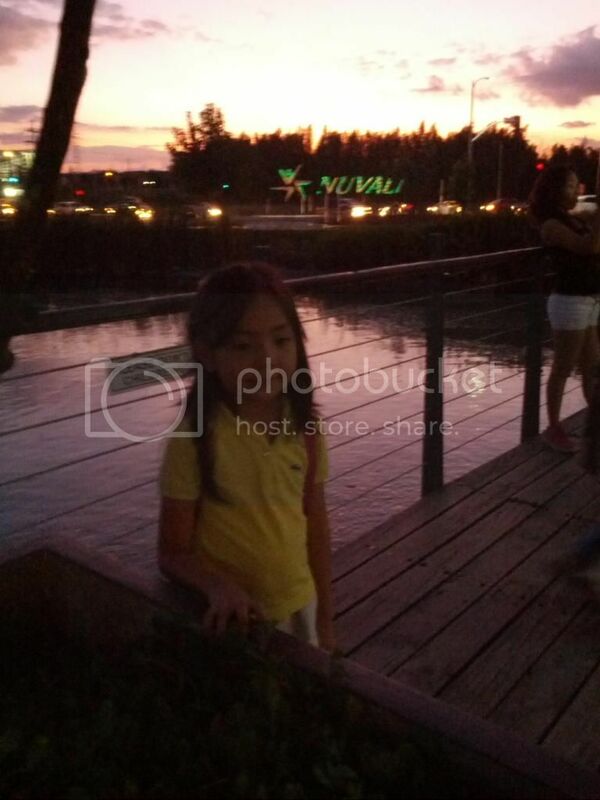 This is my daughter as you could see its dark and haven’t seen fishes in this photo. By the way, visitors are allowed to feed the fishes but you should only give fish foods brought from them. Don’t you worry because it doesn’t cause that much. You could avail the fish food for P15 per pack. I’m sure your little kids would enjoy this activity. Other activities that you should do when you are in Nuvali, Sta. Rosa Laguna, these are based on what I searched online. In the list are biking for P60/hour, birds watching – various types of birds that you could enjoy. Picnics just put a blanket in the clean grass and enjoy sightseeing, or simply exchanging stories with your family and loved one. There is also outdoor movie, too bad we didn’t enjoy this thing also. Filipinos love to eat so food tripping wouldn’t be a dilemma. There are other activities to enjoy and the good thing all the activities are great for the whole family. Well, I hope to visit Nuvali once again and enjoy everything in this place.